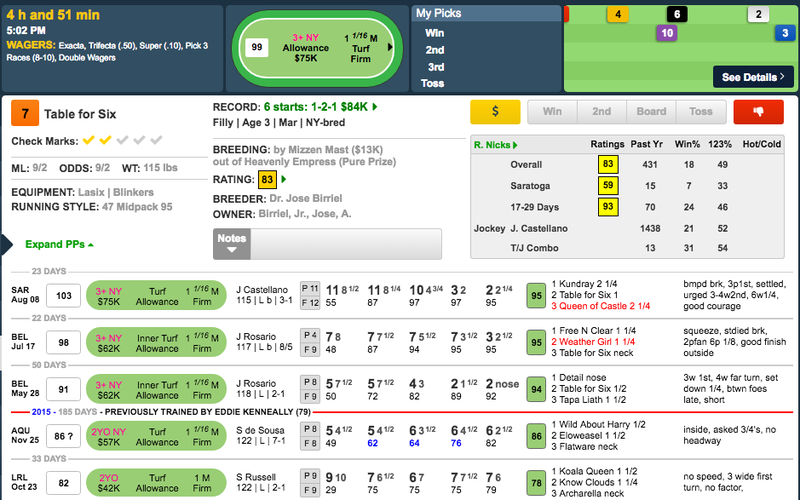 You could make the argument that TABLE FOR SIX (#7) should have won both of her last two starts. Two back at Belmont, she was badly hampered at the start when squeezed back between horses. She had to make a wide run into the stretch and finished well to get up for third behind a perfect-trip winner. Then last time she was compromised by drawing a wide post position. Javier Castellano tried to do the right thing by taking her back early, but he was never able to get over to the rail, and she had to launch a four-wide move on the far turn. I expect Javier to have her somewhat closer to the pace this time, and she looms a likely winner if she has any luck at all. The horses that I would use as keys in trifecta plays behind Table for Six include Barrel of Dreams (#3), who steps back into New York-bred company after improving against starter allowance foes; Weather Girl (#4), who took a surprising amount of money last time and ran to it, beating Table for Six, albeit with an easier trip; and Ametrine (#6), who may be a bit distance-challenged but has a right to take a step forward in her second route attempt.